If you throw, push or swing your arms, you want strong pecs. This muscle, formally known as the pectoralis major, covers the upper torso area in a fan-like shape. Exercises to work this area include the bench press, push-up and pec deck. Pectoralis Major: The pectoralis major attaches at the clavicle -- up near the collar bones -- and at the sternum, the bottom of the breastbone. In women, this muscle lies mostly underneath the fatty breast tissue. The pec deck fly primarily targets the sternal, or lower, region of the muscle, but the upper portion of the muscle does assist in the action. 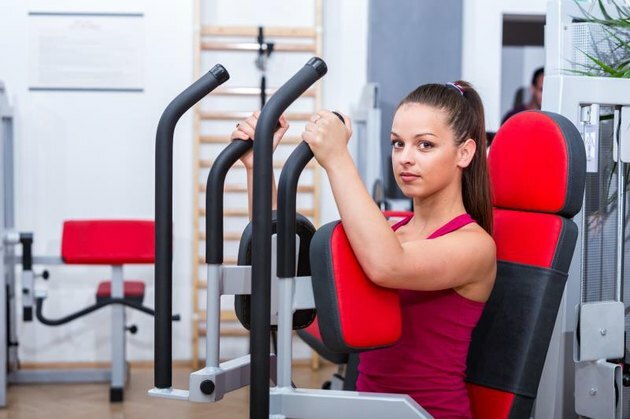 The pec deck is nearly as effective as the bench press in activating the pectoralis major, found a 2012 study sponsored by the American Council on Exercise. It's superior to several variations of the push-up, weighted incline flyes and dips when it comes to activating the primary action of the chest muscles. Golfers particularly benefit from the muscles trained by the pec deck fly, showed a study published in a 2009 issue of the Journal of Strength and Conditioning Research. Other athletes that appreciate the functional gains achieved by using the pec deck include tennis players and boxers. 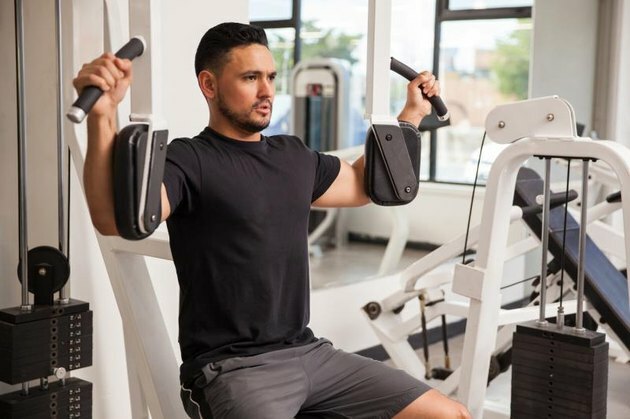 While the pec deck is effective in training your chest, you'll develop the most muscle from performing two or three exercises per muscle group to stimulate the muscle fibers from different directions. To get the most out of your chest workouts, include the pec deck fly along with the bench press and bent-over cable crossover flyes.